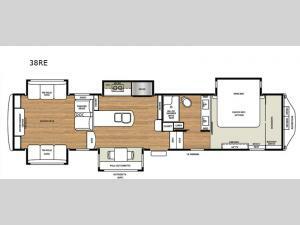 You will love this RiverStone Legacy fifth wheel for its ability to make you feel right at home! The layout of this unit replicates everything you love about your own house with a private master bedroom that has a walk-in closet, a large bathroom with a dual-sink vanity and shower with a seat, a full kitchen with a peninsula countertop, and a fully loaded living room with opposing tri-fold sofas and theater seating. As you snuggle up for the evening in the rear living room, you will love to switch on the fireplace for a warm glow and soft crackle as you watch a movie with the family on the 60" Smart TV.